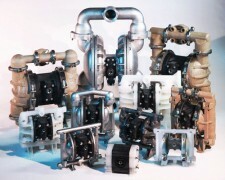 WHY PUMPAC DOUBLE DIAPHRAGM PUMPS? contamination of product and hassle free operation. Pumpac’s patented air valve won’t stall at slow speeds. The air side of the pump is constructed of non-metallic materials. If a diaphragn ruptures or if fluid is spilled on the pump, these vital parts are not destroyed. Non-metallic air valve components are also much less prone to air valve icing when air lines contain water. No air leakage when fluid discharge valves are closed. All pumps are 100% tested prior to shipment. Pumpac pumps are designed with service in mind. Fewer parts and less down time keep maintenance costs low. All pumps built with PTFE elastomers have back-up Santoprene diaphragms. Santoprene is a highly resistant EPDM and polypropylene compound. FDA and USDA rated materials are available. Five year warranty against defects in material and workmanship. Parts ship within 24 hours after receipt of order. Next day shipments on parts and parts are available for a minimal expediting charge. Modular design and band clamp construction provide ease of maintenance.